Apartment 7, Harney Peak01768 877380work Self-cateringNumber 7 Harney Peak is a luxury apartment in a traditional Lakeland building equipped with all modern conveniences and awarded a Gold 4 star rating by Enjoy England. Set in a peaceful village on the edge of Derwentwater, only 1 mile from Keswick, it is an ideal base for exploring the northern Lake District. Many personal touches create a home-from-home feel. -Private entrance with storage for coats and boots. Centrally heated and with fitted carpets throughout. -Modern fully fitted kitchen, well-equipped with gas hob, fan-assisted oven, dishwasher, washer/dryer, fridge, microwave and a good range of utensils. -Spacious open-plan lounge/dining room with comfy seating, Smart television, DVD player, DAB radio. Guests have the use of free Wi-Fi internet access and a selection of walking guides, books and films. -Beautifully presented double bedroom with ample space for storing clothes. Wall-mounted television. -Newly modernised en suite bathroom offering Mira shower in double enclosure, WC and basin. -An ironing board, iron and airer are provided, along with cleaning products for use during your stay. -Secure bike storage and drying room for wet clothing. -Garden furniture is available for guests' use on the patio outside the apartment. -Free, private parking space immediately in front of apartment. We try to be flexible on holiday dates. Short breaks are available during off-peak season between November and March, and at other times if late availability. Apartment 7, Harney Peak offers weekly bookings starting on Saturday. 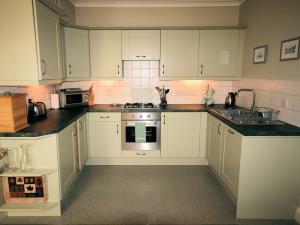 One bedroom with en suite, spacious open-plan kitchen/living/dining area. Drying room and secure bike storage available. Private parking. Separate entrance and patio area. Short breaks are available from November to March and at other times if there is late availability. Please contact owners for details. One dog may be allowed at owners discretion by prior arrangement. A fee of £20 per week applies. Apartment 7 offers weekly bookings starting on Saturday. Number 7 Harney Peak is a luxury apartment in a traditional Lakeland building equipped with all modern conveniences and awarded a Gold 4 star rating by Enjoy England. Set in a peaceful village on the edge of Derwentwater, only 1 mile from Keswick, it is an ideal base for exploring the northern Lake District. Many personal touches create a home-from-home feel. One small well-behaved dog may be accepted by prior arrangement with owner. 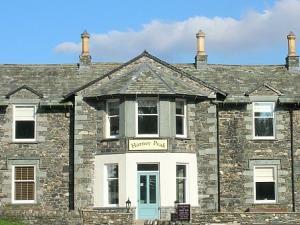 All main amenities available in Keswick, for example supermarkets, banks, restaurants, cinema, swimming pool, pharmacists. Children welcome from any age. From M6 jct 40 follow A66 west towards Keswick. Ignore first Keswick turn. After 1.5 miles go straight over roundabout, ignore 2nd Keswick turn, then take left turn to Grange, Portinscale. After 700 yds as road bends right, Harney Peak is in front of you.